Our efforts for outreach in the Caribbean expand beyond promoting awareness to the local public about their backyard biodiversity. We are also committed to mentoring, teaching, and training undergraduate students in our lab that are Caribbean Hispanics. In the past four years we have mentored two students through their undergraduate research on projects involving species distribution models of beach mice and diversity of cave microbiota in the Bahamas. 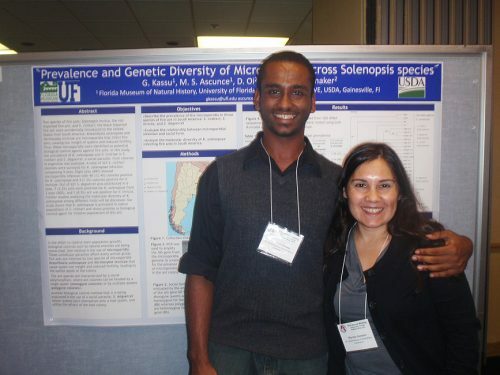 Gebreyes Kassu, undergraduate research assistant, with Dr. Marina Ascunce presenting a poster in 2011. Outreach in the mammal collection of the Florida Museum of Natural History is very diverse. Besides engaging in museum exhibitions and activities, the strategic location within the University of Florida campus allows us to provide a superb place for undergraduates to immerse themselves in scientific research. In the mammal collection, students can learn museum curatorial activities as well as cutting edge molecular tools. Undergraduates are involved in all stages of research including experimental design, fieldwork, lab work, analysis, manuscript writing, and presentation of research findings at national or international meetings. For the human-louse evolution project, Dr Ascunce mentored two undergraduate students: Jackie Fane and Gebreyes Kassu. Jackie has presented her work at two UF-meetings and she is currently a medical student at UF-Medical School. Gebreyes has presented his research at one international and four local meetings, and has submitted a manuscript to the Journal of Undergraduate Research at the University of Florida. We submitted his nomination for an undergraduate student travel award of the Society for Molecular Biology and Evolution (SMBE) to participate in a Mentoring and Diversity Program during the past 2012 SMBE Conference in Dublin, Ireland. The award and subsequent trip made a great impact on his motivation to pursue scientific career. In addition, Gebreyes was awarded Best Oral presentation during the 2012 Undergraduate Research Symposium at the University of Florida Biology Department. 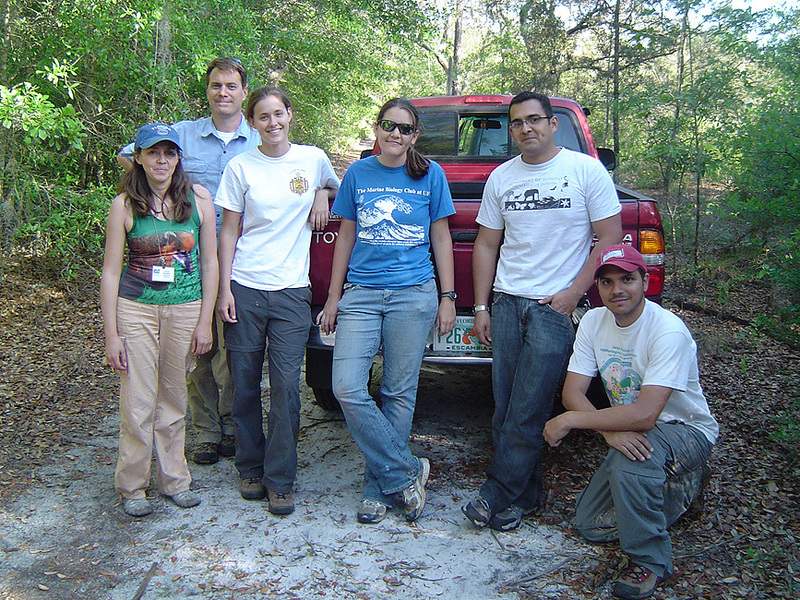 Biology undergraduate students participate in a collecting trip to San Felasco Hammock Preserve State Park. In order to facilitate processing of museum specimens, several student and adult volunteers have been trained and mentored at the Mammal Collection. Thanks to our wonderful volunteers, skeletons and skins can be quickly incorporated into the collection while also promoting education of students and the general public.